Resident at the San Antonio State Supported Living Center. Texas runs 13 living centers -- more than any other state. The San Antonio State-Supported Living Center (SA-SSLC) is on South New Braunfels and sits on 40 acres, housing 235 residents -- in the state system there are 3,60 residents. Cecila Cavuto is the communications director for the Texas Department of Aging and Disability (DADS), the state agency that runs these living centers. “We provide 24-hour residential care for individuals who have a primary diagnosis of an intellectual or developmental disability," Cavuto said. "Many of our residents also have a medically fragile condition and/or mental illness as well. 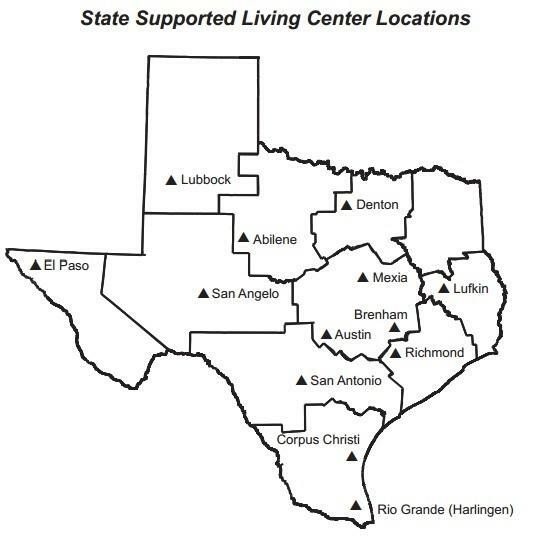 All of the state supported living centers provide complete, total care for the residents. So that includes medical care, dental care, dietary needs, mobility needs, communications, speech therapy, physical therapy, occupational therapy, as well as the normal day-to-day activities." The buildings have a vintage institutional look to them. The campus was originally the Texas State Tuberculosis Hospital, which opened in 1953. In 1978 the buildings were transferred to the Texas Department of Mental Health and Mental Retardation. Ralph A. Henry, director of the San Antonio State Supported Living Center. But despite the age of the buildings, SA-SSLC Director Ralph Henry said they have the most modern equipment, including a dental clinic. “We have three dental chairs that we set up for each of the patients. All the dental treatment that they need we try to do in house,” said Dr. Alvydas Kukleris, the resident dentist. Here many of the residents have a chance to earn a little money by working in the occupational center. This morning some are putting rosaries in individual bags for Oblate Missions, some are counting out hand towels which will be used at Bill Millers’ restaurants others are sorting yellow plastic parts for sprinklers. “We try to break down every job into some task that somebody can perform,” said Patrick Haas, a vocational counselor. On the surface the SA-SSLC looks to be a well-run facility with a caring staff that is meeting the challenging needs of their medically fragile and intellectually disabled residents. However, that’s not what the experts see. Residents stand outside a housing unit at the San Antonio State Supported Living Center. “We have a lot of individuals who are our most vulnerable, who need our most care and are not getting it at all,” said Beth Mitchell, the lead attorney for Disability Rights Texas, a nonprofit that advocates for the disabled. For the last five years the 13 Texas state-supported living centers have been routinely inspected and closely monitored by the U.S. Department of Justice. These monitors have found the conditions at the centers to be woefully substandard, the care they provide to be unacceptable, and there are continued problems with abuse and neglect of the residents. Mitchell pulls out a laptop and calls up her graphic analysis of monitor’s reports on the San Antonio center. A green or orange box means the center is meeting that benchmark, a pink box means out of compliance, and there are a lot of big sections of pink. Custom-made wheelchairs at the San Antonio State Supported Living Center. “Physical and occupation therapy? They are not in compliance. Dental services? You had seen their dental area. It’s not in compliance," Mitchell said. "You saw it. You thought it looked great But in terms of what care they are getting from that dental area they’re not getting it. You know it says adequate and timely routine and emergency dental care and treatment. They are not in compliance." 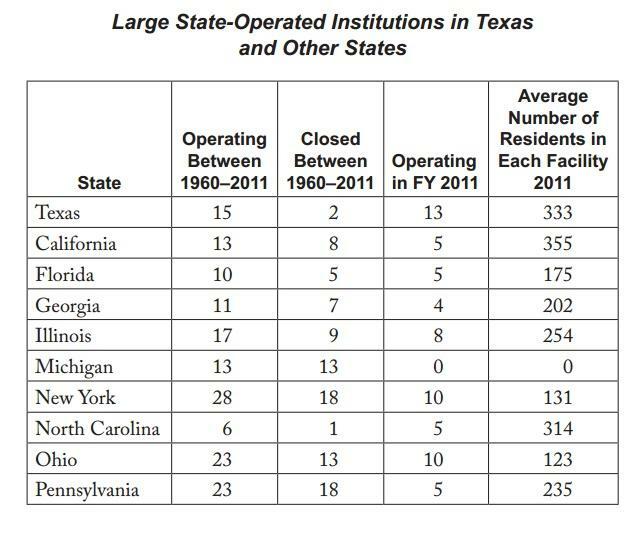 These baseline compliance benchmarks of care were agreed to by Texas after being sued by the U.S. Department of justice in 2009. The DOJ investigated and found that the Texas state-supported living centers were so inadequate that they were violating the rights of the people there. At the time the facilities were called “Texas state schools” – a misnomer because there was no schooling happening. In fact, just the opposite; the facilities were called out for rampant abuse and deadly neglect. It was so bad that Texas didn’t even try to fight the suit and quickly agreed to a five-year settlement. In a May 22, 2009 hearing before the state Senate Committee on Health and Human Services, David Morales of the Texas attorney general’s office explained to the lawmakers they really had no options. The agreement was passed and Gov. Rick Perry signed the bill that codified the settlement. “This marks a substantial milestone in our state’s approach to caring for some of our most vulnerable citizens,” Perry said in a bill signing ceremony. The settlement agreement was for five years, which is now up. Cavuto, who is with DADS, said that five year mark isn’t significant. But lawmakers at the time of the settlement’s negotiation and agreement were repeatedly assured this would not be an ongoing issue. Nevertheless, it’s been five years since the settlement and Texas has proven that in that time it was unable to meet the basic standards of care. Also currently Texas is trying to renegotiate the settlement agreement dealing with the monitoring and the compliance benchmark. But the big question is what happens next? Will the centers be allowed to continue to operate while providing substandard and even dangerous care? Recently the Texas Sunset Commission announced recommendations to close six of the state supported living centers, but not because of quality of care issues. The recommendation is because of how expensive the system has gotten for Texas.